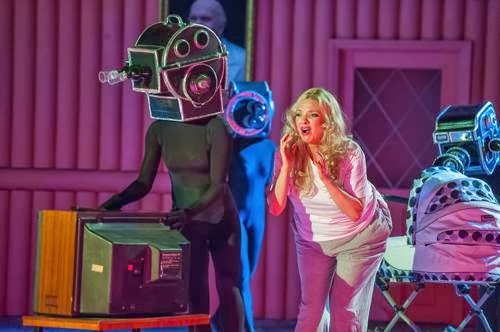 Mark-Anthony Turnage and Richard Thomas have brought Anna Nicole Smith’s silicone-enhanced charms to the Brooklyn Academy of Music, in a co-production with the New York City Opera. We open with the chorus, describing Anna Nicole’s tale in a prologue that seems to be borrowed from Sweeney Todd. 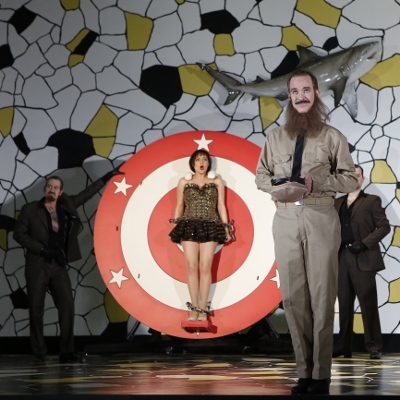 They present her as both an “absurdist tale of woe” and a “fabulous eccentric.” The first half of the opera presents in a series of short scenes a relatively amusing, obvious satire of American trashiness. This shows Anna’s rise to fame through fast food, teen motherhood, and stripperdom. Finally she marries the elderly oil baron J. Howard Marshall II. In the second half, Marshall dies and the opera suddenly makes an awkward jump of a decade to show Anna in addicted decay. It leaves out the years of Anna Nicole’s legal fights in favor of showing her final months and attempts to be a tragedy and indict the grotesque pleasure we took in the first half. The chorus becomes a creepy voiceless swarm of dancers with cameras as their heads. It doesn’t really work; the creators want to have their satiric cake and eat it too. One problem is that Anna is left more or less a spectator in her own story. She is presented as superficial and incredibly stupid (the occasional note that she was “smart” doesn’t counteract what it is showing us the rest of the time), as well as passive and reactive. The libretto’s baffling lacuna is also at fault here, excising the years where she was a Famous Big Personality but rather showing her pathetically trying to deal with the consequences. The original soprano who sang Anna Nicole, Eva-Maria Westbroek, has a hefty voice and was imposing and ungainly onstage. Sarah Joy Miller, singing Anna Nicole here, has a much slighter presence both physically and vocally. Her default expression is a deer-in-the-headlights look of smiling amazement, which is, to be fair, just about all the libretto gives her to work with. Lacking agency, personality, and much in the way of self-reflection, Anna succeeds as neither a heroine or an antiheroine. The libretto is incredibly wordy. Thomas loves lists (more Gilbert cluttered than Cole Porter languid), and his verse starts tripping over itself when getting stuck on long lists of synonyms for breasts, deadbeats, etc. I swear that the composition of this libretto must have involved a very profane thesaurus. These lists usually end with a line like “you get the picture,” as if the situation is simply too outrageous for his words to contain. The language is an intentionally heightened, stilted colloquialism that is sometimes funny but mostly vocally unfriendly and sometimes less stylized than just plain dated (even my family doesn’t say “harsh the vibe” anymore). 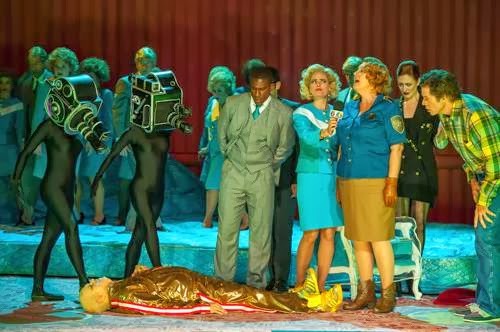 The strongest element of the opera is Richard Jones’s inventive, fluent production, which has been transferred from London. It keeps the action moving and offers genuinely amusing visuals. Miriam Buether’s colorful sets and Nicky Gillibrand’s costumes are also great: there is a lot of bright pink, giant plastic animals, a giant mattress, and a tendency for dying characters to finagle their own body bags. The ensemble is less universally strong and dramatically attuned than it was in London, but they’re all giving it their best and their Texas accents are far more consistent. Miller seems a little too cute for Anna Nicole, and never convincingly debauched. Susan Bickley, the lone holdover from London, makes a strong impression as her mother, but the character is awkwardly transformed from a monster to the voice of conscience. 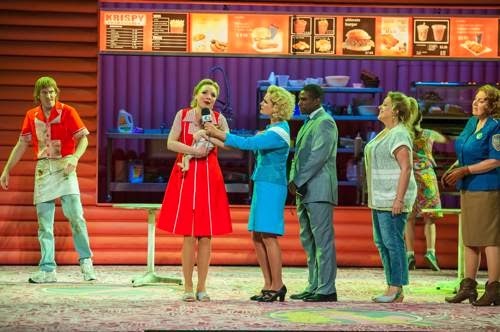 Broadway stalwarts James Barbour and Mary Testa are wasted in the tiny roles of Anna’s father and aunt, while Richard Troxell has a better cameo as her plastic surgeon. Robert Brubaker is funny and loud as J. Howard Marshall II, and Rod Gilfrey is also wasted in the small role of lawyer Howard Stern (reportedly cut down before the London premiere due to threats of litigation from the real Howard Stern–fittingly, the character frequently enters pronouncing his intention to sue everyone). I remain somewhat uncomfortable with this opera. 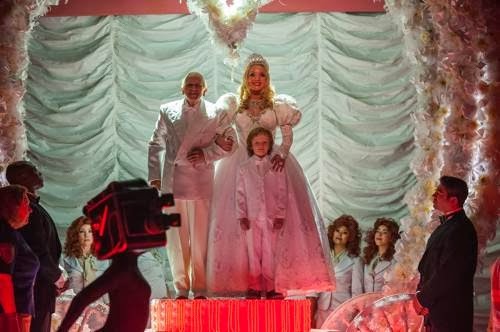 It makes me feel unexpectedly sorry for the real Anna Nicole, who seemed never fully in command of herself, exploited by others in death just as she was in life. I don’t want to be naive about this or say she was just a victim, she knew how to play the game and took what she could. (Besides, I don’t know anything about her.) But we never really see that in the opera, which seems to have plenty of interest in watching a hot mess but no interest in understanding a person. (Its most persuasive act of empathy is for her son.) I can’t quite shake the feeling that here we have a bunch of privileged men again profiting from Anna Nicole’s lack of privilege. It leaves a bitter aftertaste to an opera that already is somehow less than the sum of some formidable parts. This brings me to City Opera itself. This is a co-production with BAM, which seems to be just the right place to produce it: it’s an institution that has long explored works that cross between high culture and low. But the City Opera, now in desperate financial straits, is promoting itself as “The People’s Opera.” This seems tone-deaf. 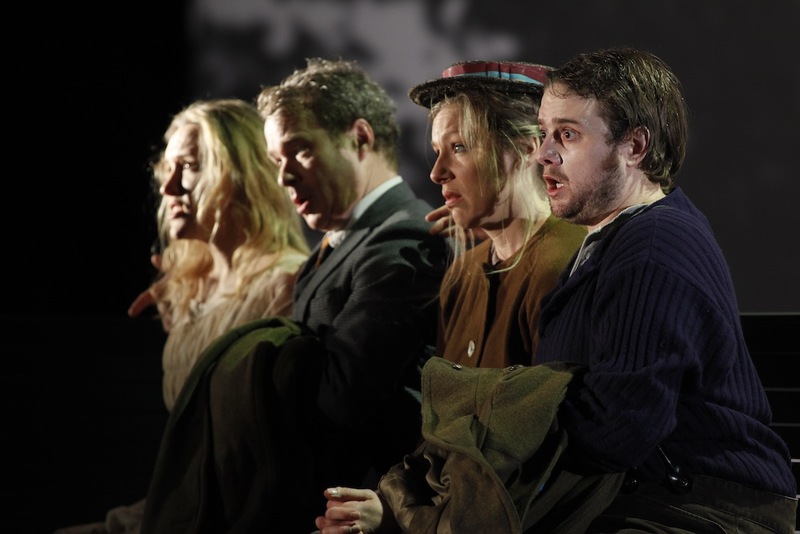 “People’s Opera” implies something populist, an element that is family-friendly, and accessible. That’s City Opera’s history. But now they put on a small season of Johann Christian Bach and Telemann operas. There’s absolutely nothing wrong with that, we need people who will tread where the Met doesn’t, and I hope they’re able to keep doing it. But that’s a boutique company, not a populist one. The Met’s outreach and HD series makes it look much more populist than City Opera does right now. So I hope the company survives, but am worried about their apparent confusion of mission, and wonder how they got here. If this is their last production, at least they went out with something that seems appropriate to their aims. Anna Nicole plays through September 28. 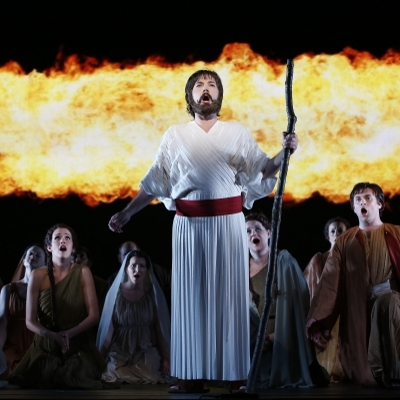 I went to see the New York City Opera’s production of Mosè in Egitto at City Center , and I wrote about it for Bachtrack. few stumbles along the way. You can read the rest here. It was a frustrating afternoon: some very talented performers and interesting production ideas (Harry Kupfer’s Rossini video game) that ultimately didn’t quite make a full show. I still think it’s worth seeing, though: it’s a unique spin on an unusual piece, and that’s something in itself. A few other notes, though. I wish City Opera would show some care with its presentation. (Their website doesn’t even give the address of the theater where they’re performing. I had to Google it.) This performance was trumpeted as the “original version.” Putting aside the problematic construction of “original” and its implied superior status, that can’t be true: the third act of the first version was lost, as you can read in the introduction of the critical edition. (This production didn’t even use that critical edition; the program credits Hendon Music/Boosey and Hawkes.) I would have liked some program notes, but maybe I’m alone there. If you’re going to claim scholarly status, you have to do your homework. But enough of that, the actual performance did exceed my expectations. 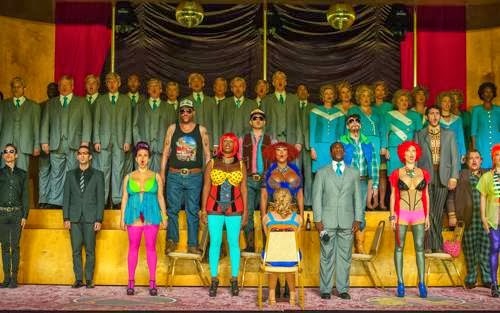 The LED video (more like a TV than projection scenery) occasionally looks like the VHS version of the Met’s Parsifal Blu-Ray. Jayce Ogren isn’t a Rossini conductor but the orchestra is sounding much better than it did last season and it’s good for the City Opera to have him on board as music director. There’s some good singing. So still recommendable, if you like Rossini. I went to see Orpheus (not that one… or that one… or that one) at the City Opera and wrote about it for Bachtrack. unwilling to confine itself to one geographic location. Click here to read the whole thing. It’s an intriguing work but not ultimately a spectacularly rewarding one, at least in this production (though Jennifer Rowley is really great in the central role!). It was also an extraordinarily odd choice to produce. (I heard that it resulted from George Steel meeting someone who has worked on it extensively. Not from research in “baroque operas we should put on.”) I’m all in favor of choosing weird and random repertory, so on the one hand I’m proud of them for doing it. But on the other, are we running before we are walking here? I mean, when it comes to recently discovered operas, New York (unless you count New Haven) hasn’t gotten a staging of La finta pazza yet, which is a much more important work. When you have such a tiny season each choice has to be good, and this one while it was promising didn’t quite pay off. Also be aware that while the running time is listed on the website as two and a half hours, it was just shy of three on Saturday. El Museo del Barrio’s theater is functional enough; I was sitting too close to the front to judge the acoustic properly. 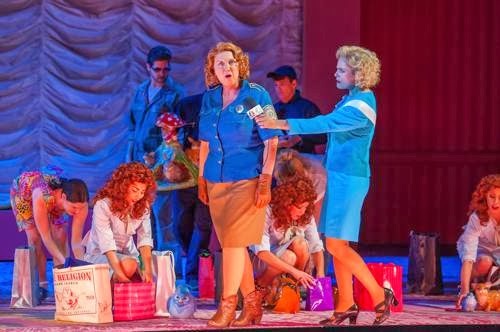 City Opera is hanging on by a thread, and their current Così fan tutte reminds us why New York needs them. Christopher Alden’s bold and exceptionally thoughtful production pits a bunch of repressed kids against the terrors of young adulthood, and the cast is excellent. Those in search of ruffles, cheeriness, or, unfortunately, an orchestra that can play in tune or support the production at all will be disappointed. But in this small theater, it’s the most inspired Mozart production I’ve seen in New York in a while. Mozart, Così fan tutte. New York City Opera at Lynch Theater, 3/20/12. New production by Christopher Alden, conducted by Christian Curnyn with Sara Jakubiak (Fiordiligi), Jennifer Holloway (Dorabella), Marie Lenormand (Despina), Allan Clayton (Ferrando), Philip Cutlip (Guglielmo), Rod Gilfry (Don Alfonso). I’m not sure why C. Alden decided to set this production in a Seurat-ish 1920’s Paris straight out of Sunday in the Park with George. The entire thing seems to take in a park dominated by a very long bench, with umbrellas (used in a very Rossinian storm in the Act 1 finale) and occasional interloping picnickers. It doesn’t get in the way or add much either way, and Alden’s focus on the psychological development of the characters renders it more or less irrelevant. This production is a slow burn. The first act is played out in very static, stylized fashion. Our four young people are exceptionally tight-laced and inexpressive sorts, moving slowly and never looking at each other. The original couples don’t seem to have that much in the way of genuine feelings. It all unfolds in a kind of slow-motion, zombie-like stupor (I was reminded of acting exercises in which the director yells “be a sloth! you’re a sloth!”). Don Alfonso is a mysterious magician figure who seems to want to shake these poor kids’ world up a bit. The boys’ disguises are nothing more than a series of mildly crazy outfits–a ruff, those silly hats with giant ears, and other things that the straight-laced Ferrando and Guglielmo would never touch. Despina is a helpful crazy bag lady and handywoman (not apparently in the sisters’ employ, but that works). I noticed that partway into Act 2, Kelley Rourke’s convenient surtitles (which had previously glossed Despina tasting the chocolate to work with the staging) stopped translating “donna” as “girl” and began saying “woman.” It’s not in Da Ponte, but that’s surely what Alden was doing. All hell breaks lose. Don Alfonso shows up in a bear suit (more bait for a review from The Awl than Stefan Herheim), and the couples go through tense and ultimately traumatic coming of age–apparently the original couples were virginal, but the new couples are not. 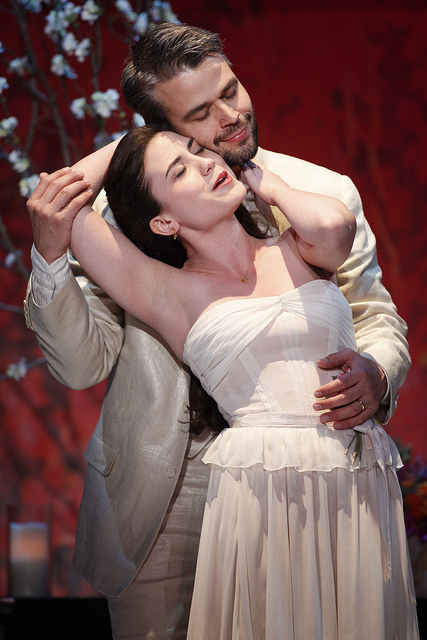 The emotion they had been holding back through Act 1 finally finds an outlet, and it’s pretty scary for everyone–Dorabella’s “È amore un ladroncello” is a nervous wreck, and Fiordiligi’s impulse to just get out of there for once makes real sense. At the end, we don’t end up with couples at all but the sisters in one group and the men in the other. This is going to take some time to get over. It’s a very serious production, and takes the mock-opera seria elements of the score in total earnest. (I was reminded at times of David Alden’s more elaborate but equally grim Finta Giardiniera, but I think C. Alden is much more successful here than his brother was in that case.) But it’s a convincing one, and best of all a human and woman-friendly take on an opera that is often breathtakingly cruel. Both the men and women doubt what they are doing at every step (the men first go to their original partners before Don Alfonso rearranges them, and Fiordiligi sings “Per pietà” directly to Guglielmo) and feel enormous amounts of hesitation and guilt, and yet are driven somehow to escape the sloth-world of the opening anyway. It’s a voyage of discovery for everyone, men and women alike, and despite the title there’s no statement about fidelity on behalf of either gender. There are some random bits, but it keeps moving and sometimes you need some rabbit ears to spice up your unit set and six-character opera, I guess. It’s awful that City Opera moved out of the formerly-known-as-State Theater at Lincoln Center and has been reduced to such a pathetic little season, but the Lynch Theater at John Jay College is just the right size for Mozart opera, with a lovely intimate atmosphere. The acoustic is dry and unforgiving, and showed the problems of the orchestra mercilessly. This was not professional-level playing, with terrible ensemble and intonation and just crass playing from every side. I can’t judge the contribution of conductor Christian Curnyn, the tempos were OK but musically was just a mess. With decent orchestral support, this production could have been so much better. And no stage music, City Opera? To this we’ve come? 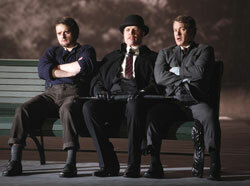 The cast was excellent, and most importantly were visibly all in the same production. Sara Jakubiak has a spicy, strong soprano; Fiordiligi is a killer role and she struggled with the low notes and some of the coloratura. But it was a committed and musical performance, as was Jennifer Holloway’s richer-voiced Dorabella. Allan Clayton as Ferrando was the vocal standout of the cast with an evenly produced and very clear Mozart tenor sung with style and no apparent difficulty with the tessitura, and acted with sympathetic bashfulness. Philip Cutlip was the resident barihunk Gugliemo of any self-respecting Così but vocally OK at best. Marie Lenormand as Despina provided most of the production’s goofier moments with cute humor, and her mezzo is light enough to pass as a soubrette. Rod Gilfrey sounded loud and blustery as Don Alfonso, and was more an enigmatic Wizard of Oz than a teacher at this School for Lovers. I could see this production being a big hit at somewhere like the Theater an der Wien. (My last Così was actually at the Theater an der Wien–in the Chéreau production, featuring Elina Garanca as Dorabella, so you can guess that it wasn’t super-recent.) In New York, it’s a refreshingly smart and interesting take on a repertory served badly in the oversized and conservative Met, but the serious musical compromises are unfortunate. Two performances remain: March 22, and 24. Photos copyright Carol Rosegg. Sorry for the bad quality, but I had to scavenge, as City Opera’s “Photo Room” wasn’t very helpful.